Chair inspired by the world of contract, it can find also an ideal location within private and outdoor spaces giving a touch of freshness. In the Koki chair, technology and design merge perfectly. Lines and harmonious details create a shape which appeals whichever way you look at it. 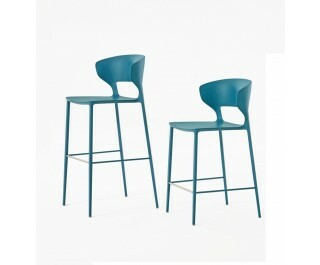 Stacking chair and barstools with seat made of integral fire-resistant polyurethane, in-mould coated and inside frame in steel. Steel legs in conic shape tubular, square section, in the following finishes: chrome, lithium, matt ossidiana or lacquered in the same colours as the body. The version with lacquered legs is also suitable for outdoor.